YubiKey enables full multi-factor authentication via hardware token when it is not feasible or desirable to use a soft-token. It enables strong cryptographic protection and seamless touch-to-sign functionality wherever logins are processed in the Authlogics ecosystem – on Windows Desktop, for access to websites and cloud applications, access to remote systems and any scenario supported by Authentication Server. YubiKey devices are managed, together with user accounts, using our Management Console snap-in, via our Web Operator portal or user-provisioned via Self Service Portal. Device information is securely stored in Active Directory or SQL Server. 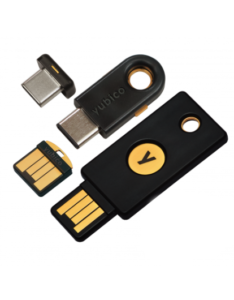 YubiKey prevents unauthorized access by requiring the physical presence of the key to log in to a device. YubiKey can be configured as ‘something you have‘ as part of a traditional multi-factor authentication process, or as password replacement, or a mixture of both. The user plugs the key into a USB port and touches the gold button or edge of the key to generate a unique password string. When processing this, the device Id from the password string is checked against the value stored for the user and the password string is then sent to the YubiKey servers to determine if the login is correct. We support all YubiKeys that are USB-A and USB-C compatible, including YubiKey 4, YubiKey4 Nano, YubiKey 4C and YubiKey 4C Nano. The YubiKey 4 and YubiKey 4C are designed for keychains, so they go everywhere you do, whereas the YubiKey 4 Nano and YubiKey 4C Nano are designed to stay inside the USB port. Yubikeys can be provisioned in minutes by either the administrator or the user. A YubiKey is provisioned to a user by adding it as a device, either by the administrator via the Management Console or Web Operator Portal, or self-service by the user using the Self Service Portal. Works with Authlogics Authentication Server to provide Emergency Override Access, and AD password resets. Hardware secure elements guard your encryption keys. YubiKey is integrated into Authlogics Authentication Server. Click Download to start a free trial.